Surprisingly, not too far from the busy and highly urbanized Metro Manila, there still exist a golden sand beach where spectacular sunsets can be viewed. 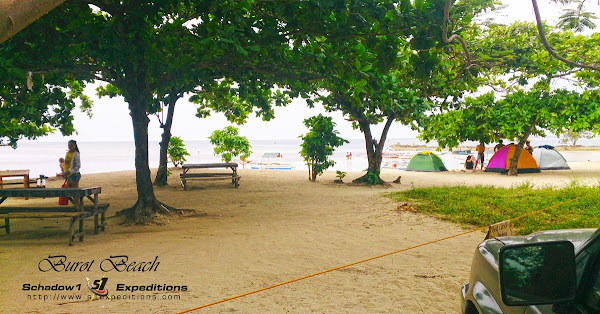 A perfect beach to be one with nature through the absence of posh accommodations. Development of this beach may soon take place. But while it is still virgin as it is, this is the right time to get to this paradise. 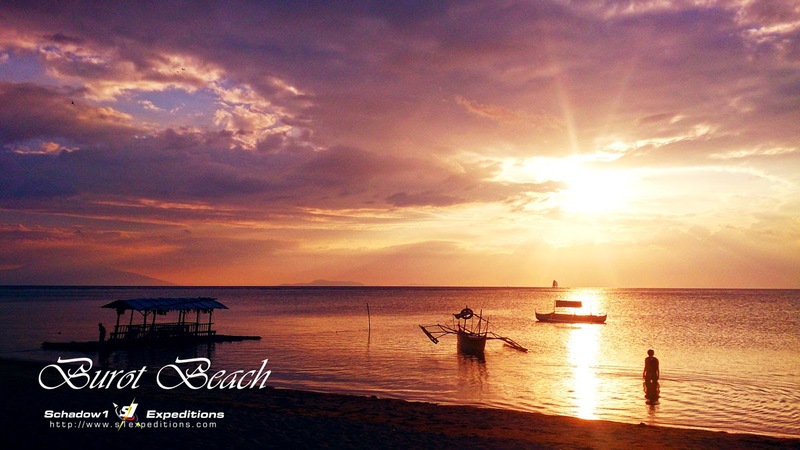 Situated at Luzon's southwestern edge, Burot Beach is one of the best beaches of this side of Batangas. Burot Beach is a golden sand beach at the Municipality of Calatagan in the province of Batangas. It is about 130 kilometers away from Manila, roughly about 4 hours travel by land passing through Tagaytay when plying through the South Luzon Expressway or through the Kaybiang Tunnel passing through the Tagaytay-Nasugbu Road. The beach is still virgin and has not yet been developed; and the only accommodation available is by pitching out your own tent. About 3 sari-sari stores are present on the main beach which also serves a couple of grilled dishes including sea urchins and fresh fish caught along the beach. A make-shift shower room and 2 toilets are available for public use however be aware that these toilets are something mountaineers are mostly accustomed for; so visitors eying for a classy toilet ambiance would only get disappointed. The famously known Burot beach is the one facing directly west, which is a best vantage point during sunsets. From here, the mountains of Lubang Island and Mt. Calavite of Mindoro can be seen from afar. A parking area and stores are available here in case the supplies you brought for an overnight camp is insufficient. However if you are the type of a beach bummer who would like to go to a serene and uncluttered beach, there are a couple of beaches along the area which are accessible through a short trek passing through mangroves to reach it. 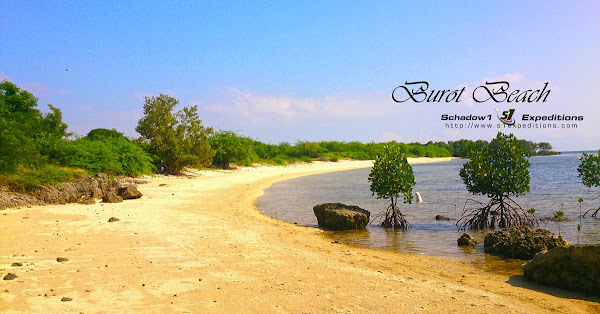 The Burot South Beach is an alternate beach camping area not too far from the main beach while there are still two more hidden and longer beaches available at the south just passed the mangroves area which can be accessed for a 30-minute trek. Fewer people pitches their tent at the hidden beaches due to its distance from the stores however if serenity is your thing, those are the perfect areas to stay for a night. As for insects, I slept on sand and hadn't had any mosquito bit me all throughout the night. But this may be depending on the season. Coming from Manila, you may ride a bus to Calatagan at the SWIPTS Terminal in Paranaque. Drop off point is at the bus station near Calatagan Market. 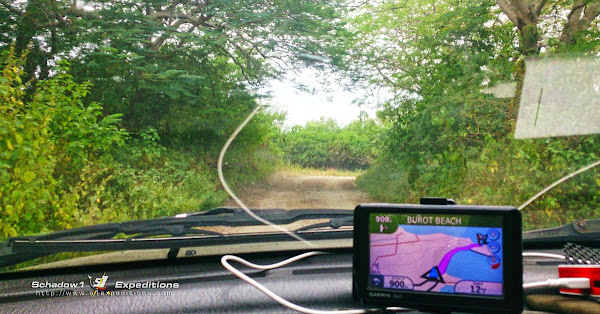 From there, ride a tricycle or jeepney for rent to Burot Beach. The beach is about 30 minutes away from the bus station passing through the Calatagan Cemetery, rough roads and a narrow track passing between swamps before you reach Burot. We went there using a private vehicle so we do not have commuting costs but roughly, the bus ride from Paranaque to Calatagan is not more than Php160/pax. Php 65 per pax, P130/pax if overnight. Php 200 rental for a picnic table. Bonfire service is also available for a fee. Costs of products in the sari-sari store is the same as regular stores. Total Estimated Budget per pax: Php 600 overnight including food. If you happen to have more time to explore after beach bumming at Burot, for another 1-hour ride, you can reach the Cape Santiago Lighthouse which is at the southwestern-most tip of Luzon. 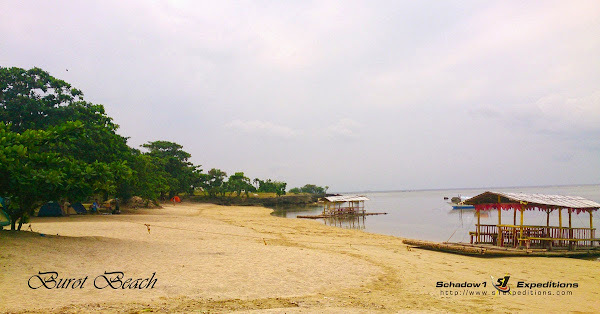 Schadow1 Expeditions was at Burot Beach to relax and at the same time map the area and a few parts of the Municipality of Calatagan. The mapping data has been contributed to +OpenStreetMap Philippines and a regularly updated GPS navigation map of the Philippines is being served by this site #mapPHL and is available for free download so that a Filipino would not be a stranger to his own motherland.